General quick question. Hoping someone can weigh in. What is the ideal number of stocks to hold or aim for, if you are investing in individual companies. Basically at what point do you say, okay I'm diversified enough now, and anymore will just make my portfolio too big. For me it's more about sectors - no good having twenty companies, but they all in resources or financials. for me, if I really like a company - I can go up to 10% - but for most around 5%. Small punts - 1-2%. I have around 30 - 40 companies in my LTP. I do have an income producing portfolio as well - mainly property with around 25 - 30 REITs. Probably a smart way to go about would be a few ETF's covering 70% of your portfolio - and 30% individual shares - maybe 5 or so. If you are impatient like me do as I do below. :-) Wait for a minor pull back and buy on the lows. I bought half of what I wanted to spend on the arrow and will now wait to see if it breaks line A. If it does so I will put the rest in. 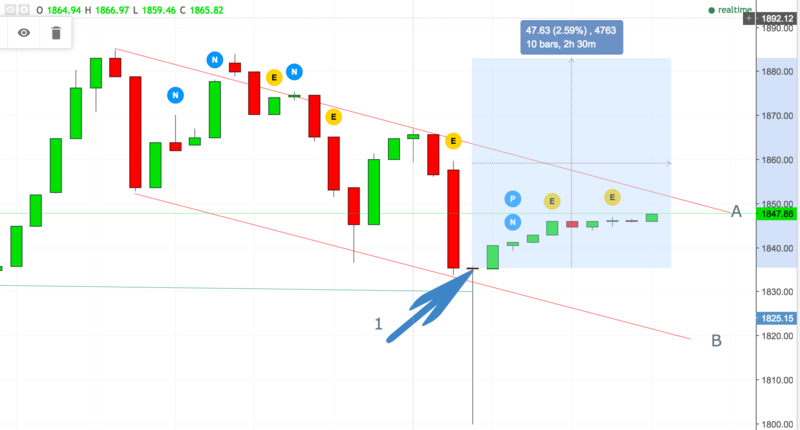 If it heads back down to line B i will see if it breaks it and wait for the turn or if it heads back up on touching the line I will see where it is in relation to my original buy in before I decide to put the rest in. I cannot wait for Rolfes to pick up. I want to sell on 700 then I will be happy. Yeah true definitely need to spread out across the sectors. I'm currently sitting at around 15 so I guess I could add a couple more. There's quite a few stocks that have dropped in price that's looking quite tempting to get into. AdaptIT for example. A concern is that, if I'm investing a certain amount every month, increasing my portfolio reduces how much each company gets. Perhaps its better to focus on a limited amount of shares. ETF's are great, thought of investing in them to form a foundation of sorts, but they usually come bundled with a company or two that I don't want my money in. What the hell is going on with Rolfes? 90% of the businesses revenue is generated locally so maybe this has something to do with it? Wonder me too, considering buying more Rolfes..
Sheeesh, that is my situation now... Do i buy more or do I wait this out. My average purchase price is 320 and a month ago I was still in the clouds. Now... Gut feeling says this price dive is not due to any issues or pressing concerns, but was rather some investment firm or fund manager(s) cashing in some major profits. Heart and brain does not believe gut enough to buy more at this stage. I wish I bought high, this was the first stock I timed perfectly by accident. I should have sold a few months ago when everyone was spamming the live chat on the website about how high rolfes is. But I do not want to lose some I want to win all of it. I think Rolfes is running since one of their product lines is they supply specialized fertilizer products, and the farmers planted flat out following the drought , even the winter crop guys are planting where they have irrigation. Can anyone explain how the Sibanye new rights offer will work? They are offering 9 shares for every 7 shares you own at R11,28 per share. How will that affect the current share price and if you bought shares via Easy Equities will they have the new shares available there? How does these things typically work? Hi Beamer, I would also like to know how this works and if other think it is a good deal. The share price has dropped significantly over the last couple of days, so not sure if it is worth it? You should get an email from EE with an instruction from. Will follow 100% - was worried that it was going to cost me a way to much, but this is doable. Still not that happy about selling the jewelry business - and I think their excuses was BS. But would like to see Starbucks rolled out way quicker than it has been. How does a claw back work? I have seen a rights offer before, but I do not understand how this works. With regards to Sibanye, if I have 92 shares how does the offer work and costs. Also do you have to take the full offer or could you go for half the offer? Don't think there are any other fees incl broker fees - haven't for me in the past - this is called following your rights. IF you SELL your rights (there is a value attached to them ) - ABSA will charge you minimum broker fees - but EE won't - or at least did not for me last time with CIL.